When we were asked to create a brand, website and brochure for Slateware, our creative team was immediately inspired. Slateware comprises three ranges of contemporary tableware designed by the two Michelin-starred chef Michael Caines. The ranges – Fine, Honed and Occasion – includes plates, coasters, cheeseboards and serving platters, each designed to showcase the natural beauty of Welsh slate. Not surprisingly, visual appeal was of paramount importance when designing the brand and website. We came up with an inspiration theme ‘create wonderful’ and this concept led the design approach at every stage. We wanted customers to see that dining with Slateware would add an extra touch of ‘something special’ to a meal. Our intention was to create an ambience of restaurant-style dining at home, focusing on the high quality of the slate, its cut and its design. Slateware is premium product, so the brand and all marketing materials needed to represent quality and a luxury design style. The slate in Wales, is renowned for be the most durable and best quality known to man. This authentic heritage needed to be portrayed from the brand and all items of marketing. One of the biggest challenges with the website was to create a online destination, which inspired and engaged people, at the same time as be functional and practical. The logo consists of simple, clean lines to reflect the smooth cut of Slateware, and the colour palette and fonts have been deliberately chosen to give a strong and cohesive overall style to the brand. 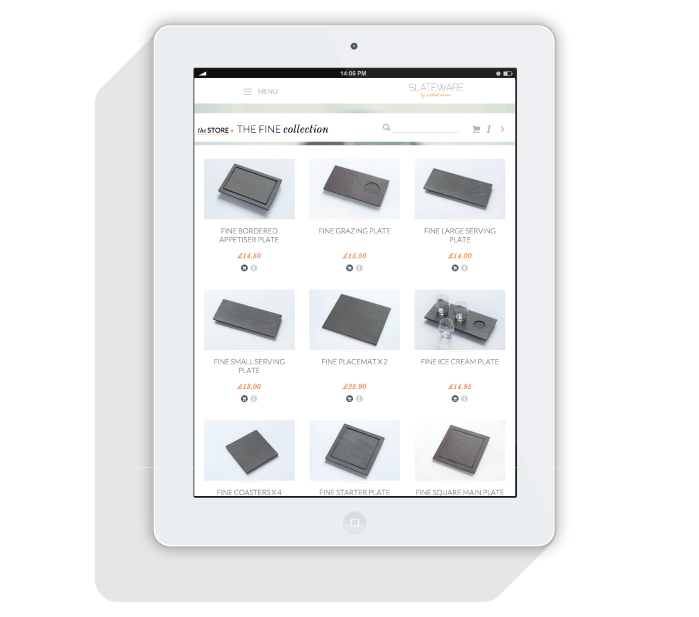 From the home page, visitors are directed to either ‘enjoy the experience’ to view a video to learn more about Slateware, or ‘discover the collections’. Stunning photography featuring mouth-watering dishes prepared by Michael Caines features strongly throughout the site, which uses parallax technology to guide people through a visual feast of Slateware products. “This project was such a pleasure to work on,” says MD Jon Walker. The website at the time featured the latest technology , we really wanted to showcase the stunning products in the best possible way, so we used parallax scrolling and horizontal slide shows to visualise the products in the most impacting way. As well as product information pages, the site features recipes and an interactive Journal area intended to engage Slateware with its community of fans and followers. Mentions of Slateware and Welsh Slate from social media are posted to the Journal page, encouraging discussion about Welsh Slate, Michael Caines, food and relevant news and events. While designing the website we also compiled an eye-catching printed brochure for Slateware, featuring a and embossed textured cover which mimics the look and feel of natural slate. Sourcing the paper was no easy task, but the end result is truly stunning, compelling readers to open the brochure and read on.